Francis Barchi is an associate professor in the Edward J. Bloustein School of Public Policy and a core member of the Institute for Health, Health Care Policy, and Aging Research at Rutgers University. 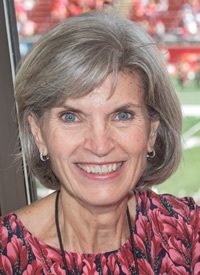 In addition, she is an affiliated member of the School of Medicine Faculty at the University of San Carlos in Guatemala. Prior to joining the faculty at Rutgers, she was a senior fellow in the Center for Medical Ethics at the University of Pennsylvania. Dr. Barchi’s work focuses on ethical issues in global health as well as the individual, household, and community factors that influence women’s and girl’s health in southern Africa. Her research interests in Africa include violence against women and children, capacity-building in research ethics education in low- and middle-income countries, and ethical issues in international research. She is currently the Director of Curriculum for an NIH-funded program in Guatemala where she and her colleagues are training physicians and research faculty at universities and research centers to serve as teaching faculty in biomedical ethics. Recently, she has begun two funded studies in Kenya that focus on social and structural factors that influence women’s health. A committed educator, Dr. Barchi teaches at the undergraduate, graduate, and post-graduate levels both at Rutgers and internationally, using case-based and active learning techniques to teach global health and biomedical ethics. 2018: Dougherty, D., Winter, S., Haig, A., Ramaphane, P., & Barchi, F. (2018). Intimate partner violence and women’s health-seeking behaviors in northwestern Botswana. Journal of Healthcare for the Poor and Underserved, 29(3), 864-880. Project MUSE, http://muse.jhu.edu/article/700988. 2018: Winter, S.C., Dzombo, M. N., & Barchi, F. (2018). Neighborhood disorganization and women’s sanitation practices in Mathare Valley, Kenya. Environment and Behavior, 1-33. doi: 10.1177/0013916518782577. 2018: Barchi, F. (2018) Priority setting in public health: A lesson in ethics and hard choices. CourseSource. doi: 10.24918/cs.2018.5. 2018: Winter, S. C., Dzombo, M., Dreibelbis, R., Barchi, F. (2018). Drivers of women’s sanitation practices in informal settlements in sub-Saharan Africa: A qualitative study in Mathare Valley, Kenya. International Journal of Environmental Health Research doi: 10.1080/09693123.2018.1497778. 2018: Barchi, F., Winter, S., Dougherty, D., Ramaphane, P. & Solomon, P. (2018). Depressive symptoms and their association with intimate partner violence against women in northwestern Botswana. Journal on Interpersonal Violence. doi: 10.1177/0886260518792986. 2014: Barchi, F., Singleton, M., Magama, M., & Shaibu, S. (2014). Building locally relevant ethics curricula for nursing education in Botswana. International Nursing Review, 61, 491-498.